Club Penguin Cheats by Mimo777 Club Penguin Cheats by Mimo777: Message From Gary: Repaired EPF! 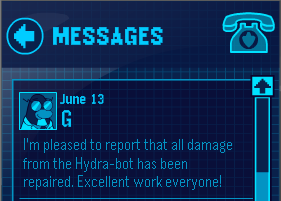 Gary has sent us a new Club Penguin message about the repaired EPF! I appreciate G telling us this, but we already knew, right? Well that's not necesaraly true when you said we knew that. If you weren't here to tel us, we probably wouldn't have known because we always just go into the Command Room, not into the Phoning Facility. soes people who don't listen to you didn't know until then probably. Mimo777! Clubpenguin justmade a big update with there home screen!Once you click play now, under the add for membership or partys, theirs one penguin that says create a penguin, and one that says login.The pictures are new and theres no news button! just wanted to tell u! At least it makes it official and not some random glitch!!! Mimo, the log in screen is back to the new one again! Yes, we know that. Mimo posted about that a few weeks ago. But good noticing! Waddle On! It says the damage is REPAIRED! Nice! But Mimo already posted that some days ago. Hey mimo77 club penguin still has the medieval shield still at the dojo and the weird thing is that it's only been a month and it came out again! there is a new login screen it shows login as a penguin with clothes on and new penguin is the outline of a penguin it looks great!